Bell Labs researchers understood how and why the technology worked. It was a departure from “cut and try” inventing, like that of Edison. All employees could talk to and mingle with any other employee, and the buildings and corporate culture was designed to insure this interaction. Junior researchers could bounce ideas off of senior (and often famous) employees in hallways, meeting rooms, and even in dinners in their home living rooms. There was no direct motivation to produce usable, profitable products. Some technology research, like the laser, even had no identifiable problem to solve or real life application at the time. There was no pressure for researchers to seek funding or grants. Funding came from revenue from the long distance and local telephone service operating companies of AT&T. Research projects that were not bearing fruit could be ended without damning the researcher. Researchers were free to pursue their own side projects and interests, and were actually expected to take on projects other than their direct assignments. Bell Labs shared all technology and research with the public, due to an agreement with the US government in exchange to preserve its monopoly. From the start of research to use in “The System” as they called the Bell System, was usually 20 to 30 years. Technology and equipment were designed to last 40 years, or more. Bell Labs was split from AT&T after Divestiture in 1984 and is now a shadow of itself, a division of Alcatel Lucent, still in the buildings in Murray Hill, NJ where the transistor was invented. Their innovations continue to live on in most electronics and communications we use today. Gertner covers the technologies and inventions of Bell Labs, skillfully and accurately describing them in a way that non-techies can understand but also resonates with technical geeks like me. More importantly he goes in depth into the history of the people that made it all happen, people like Claude Shannon, Mervin Kelly, John Pierce, and William Shockley, not only talking about their accomplishments but also their culture, family, struggles, idiosyncrasies, and failures. The book ends with somewhat of an indirect commentary on the demise of Bell Labs and the irony in that the technology they created led to Silicon Valley and the bubble/IPO/get rich quick and quarterly corporate financial results mentality we have today. It’s no longer possible to achieve the monumental discoveries in major leaps like Bell Labs accomplished. Unfortunately we have resigned ourselves to incremental improvements focused mainly on selling products, and not the pursuit of pure science and technology, which ultimately leads to better products and improvements in our lives. Gertner makes note of the outstanding accomplishments of Bell Labs in light of the relationship with AT&T, the government, and the monopoly that was maintained, noting that it shows the tight relationship between government and capitalism. I think there are lessons to be learned by both sides of the political spectrum from this, in regards to government involvement and regulations, and large corporations, both of which are often demonized today. 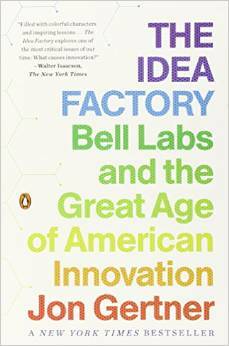 The Idea Factory doesn’t specifically mention amateur radio, but undoubtedly many radio amateurs worked at Bell Labs. I think the book and the story of Bell Labs offers some lessons for us, however. While none of us will have grand accomplishments like Claude Shannon, we can be be innovators, be creative, and pursue technology and science for merely the sake of pursuing it. Most of the major Bell Labs researchers came from modest means, often in rural America. The next Brattain or Bardeen may be that young kid in our midst who is interested in radio, astronomy, science fiction, or microcontrollers. We need to not be satisfied with just being operators of radio technology, but understand it and experiment, and create. My writing can’t do Bell Labs or The Idea Factory justice, however if you’re into technology and innovation, I highly recommend this book. This article originally appeared on Radio Artisan. ‹ PreviousDayton 2015 – Part 2 of ? Hi, Anthony. Not only have I had fun building the Arduino Keyer with all the features, but your review of “The Idea Factory” led me to amazon.com where I found a new paperback of the book for only $2.99. It arrived today and looks like fun. The inventions in the book happened back when I was becoming aware of electronics, but I was blissfully unaware of what was going on at Bell Labs. Thanks for sharing.